04:30:00 Makes 16 servings, 1/16 recipe (135 g) each. Makes 16 servings, 1/16 recipe (135 g) each. An all-time favourite, this deliciously creamy trifle is quick and easy to make and perfect for any occasion! Slice each cake layer in half horizontally to make four 1/2-inch-thick rounds. Beat cream cheese, sugar, lemon juice and vanilla in large bowl with electric mixer on medium speed until well blended. Add 2 cups of the whipped topping; mix well. Place one of the cake rounds in bottom of large glass serving bowl. Drizzle with one-quarter of the raspberry syrup; cover evenly with one-quarter of the cream cheese mixture. Sprinkle with 2-1/2 Tbsp. of the grated chocolate; top with one-third of the raspberries. Repeat all layers twice. Cover with remaining cake round; drizzle with remaining raspberry syrup. 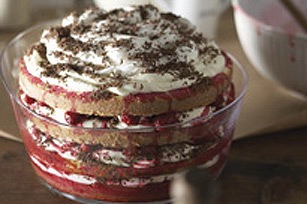 Top with layers of the remaining cream cheese mixture and remaining 1 cup whipped topping. Refrigerate at least 4 hours or overnight. Just before serving, sprinkle remaining chocolate over top of dessert. Store leftovers in refrigerator. In place of frozen raspberries in syrup, use 2 pkg. (300 g each) frozen raspberries, thawed, and 1-1/2 cups orange juice. Serving Size Makes 16 servings, 1/16 recipe (135 g) each.